ProTrump45 is an online paradise for any Trump supporter. The store has Trump hats, flags, shirts, hoodies and mugs. They also have patriotic gear like the American flag, the Blue Lives Matter flag and pro-Republican Party shirts. This store even sells the confederate flag so southerners can celebrate their heritage. If you need a mug to sip your liberal tears ProTrump45 has pro-Trump mugs you can purchase. And best of all this pro-Trump store has all of its products made in America. By simply looking on the website or the store’s Twitter page the store doesn’t appear to be owned by a black woman. No where does it cite the race or gender of the owner. But to defy the liberal odds the owner of this pro-Trump empire is a black woman. [*Editor’s note – On Saturday President Trump tweeted “thank you” to ‘Nicole’ from ProTrump45. National news reporters and Trump Twitter trackers jumped on Trump’s tweet when claims began to arise that the Nicole account was a bot. We are more than happy to share her story. Nicole is from Camden NJ and grew up in poverty with a single mother because her father died when Nicole was just 7-years-old. She was raised by a strict mother who pushed her to work harder and taught her the importance of self reliability and education. Her mother was also a conservative who owned plenty of guns, was pro-life and wanted smaller government. Although Nicole was raised by a conservative mother she still became liberal and even was a big fan of Obama. Until election 2016 when she researched statistics and realized Obama had not fulfilled his promises to the black community. Despite what the media was spewing out, Obama produced dismal statistics for black people, for example black income fell an average of $2,200 a household or an 18 percent drop. Black homeownership fell by 3 percent. Four million more black americans were on food stamps after eight years under obama. Black poverty rose to 27 percent after Obama’s hope and change. Statistics had proven that Obama’s policies had failed black Americans and Nicole had enough. She heard Trump while he was a presidential candidate say the Democrats “take advantage” of the black and minority vote. Trump also promised jobs and lower taxes, two things the black economy really needs to thrive. On November 8, 2016 Nicole Mincey along with her mother became one of 2.6 million African Americans to vote for Donald J Trump as America’s 45th president. Nicole is a great example of how big the minority conservative movement really is. The liberal media will never show her story but she is determined on defying the liberal narrative and exposing liberal hypocrisy. 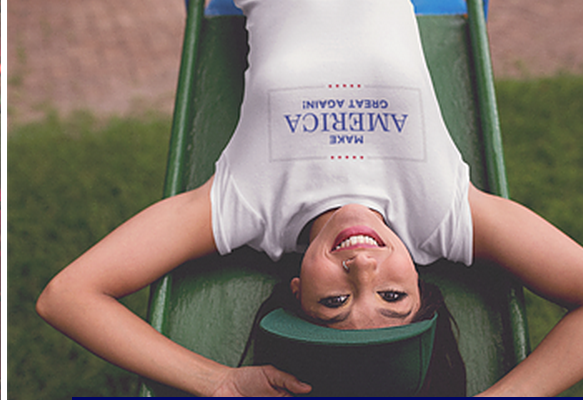 You can support this black entrepreneur by shopping at protrump45.com/shop where there is also a donation tap. Nicole and her family reveal how big #Blacks4Trump movement really is.